Visitors showed up in their thousands to take in the famous air show and see the attractions on the ground. Whether studying, picking subjects or considering a career change, employers and educators at the STEM Village, including staff and students from the Faculty of Life and Health Sciences, demonstrated a whole new world of exciting STEM orientated careers. Air Waves Portrush is the most prominent festival of its kind in Ireland and the third largest in UK, attracting around 100,000 visitors each year to the north coast. 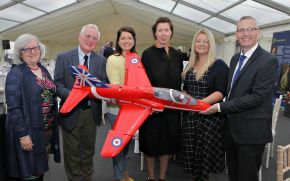 Coinciding with the 50th anniversary campaign of the Coleraine Campus, the STEM Village Marquee returned for its third consecutive year. The STEM Village features an array of interactive stalls from employers and educators that are pioneers in the industry. This year, staff and students from the Faculty of Life and Health Sciences engaged with members of the public to explore the opportunity for study or research in the STEM field. From making bath bombs to extracting DNA from strawberries, staff and students demonstrated to the future generations the excitement and variety that a career in STEM can offer. “The Air Waves event provided us with the perfect platform for us to showcase our academic excellence in science to the wider community across Northern Ireland as part of the 50 years celebrations of the Coleraine campus. “I was very proud to see how our passionate and highly skilled staff and students brought an unrivalled level of energy and enthusiasm to the STEM village”. As well as being a fun family day out STEM Village also acts as an economic driver for Northern Ireland. Northern Ireland is Europe’s eight largest region in terms of revenue for the aerospace industry. Coleraine campus itself has 750 STEM graduates each year which are helping to shape the future of the industry in NI and beyond. Ulster University is looking forward to future years in the STEM Village Marquee and the growth of STEM orientated careers in Northern Ireland. To view photos from Ulster University’s attendance at the STEM Village, check out the photo gallery here.